Sashiko is a traditional style of embroidery that uses a form of running stitch to form beautiful designs and tiled patterns. If you've wanted to try some sashiko or were smitten with these designs, but were unsure of your skills or you were looking for unique ways to work it into your projects, read on. The next time you're planning a new project, grab a sashiko pattern and try one or more of these ideas! Many sashiko patterns are designed to make it easier to follow a path of stitching, but it's okay to alter the design. For example, the photo above shows a design from the Sashiko Pattern Set 1, but with some of the lines removed. Make the pattern what you want it to be! Sashiko uses supplies designed specifically for this type of embroidery, but you don't need to restrict yourself to those. Perle cotton, for example, is a fairly common alternative to the non-dividable sashiko thread, but you can use regular embroidery floss, handspun wool threads, metallics and more. While you're at it, experiment on other fabrics, such as felt. It's common to see sashiko in blue and white, but any colors will work. You can even stitch with multiple colors in the same piece. Because traditional patterns often have repeating elements, they can be divided into sections that might be stitched in alternating colors or even a rainbow of stitches. The simple running stitches of sashiko highlight the designs and you can do the same thing with other embroidery stitches you're familiar with. This is a good way to use the tiled patterns you love without learning a new embroidery method. Instead of only working in sashiko stitches or another favorite, try layering several stitches, as you might with other types of embroidery. The sample pictured uses back stitch with six strands and chain stitch with three strands. The contrast draws attention to the pattern in a way that you don't get with standard sashiko. When you're feeling a little overwhelmed by a repeating design or you want to make something small, use only a small piece of the pattern. For example, one diamond in a pattern or a block of a design containing a few elements. Similar to using only a small section, most sashiko patterns are made up of rows and a single row makes a striking design. If you want something a little larger, stitch several rows, either together or separated from either other. This technique is great for the edge of towels. As with most patterns, you should feel free to transfer the design of a sashiko pattern at whatever size you want. Go big! Make it tiny! There are no hard and fast rules here, so play around with it because the scale changes the look. When you are using a sashiko stitch, you need to work large enough for those stitches, but if you change to a standard embroidery stitch, you have more options. Whether you go for a classic sashiko look or one of the ideas above, any of these options look great when framed in an embroidery hoop. 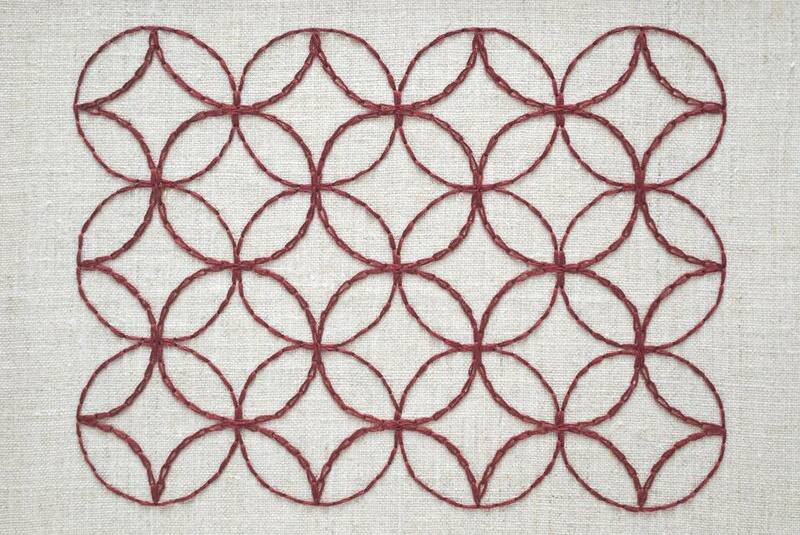 Just make sure you stitch the repeating design a little larger than the size of the hoop. If you love the look of Japanese embroidery and its perfectly spaced stitches, try applying the sashiko stitch to non-sashiko patterns. It won't work with all designs, so try to visualize how a pattern would look in dashed lines or test a small part of the pattern. Repeating patterns are usually a safe bet, but other motifs and lettering will work too. As with all forms of embroidery, when you're willing to try new methods and maybe even break the rules, you just might create the most beautiful stitches you've ever made.